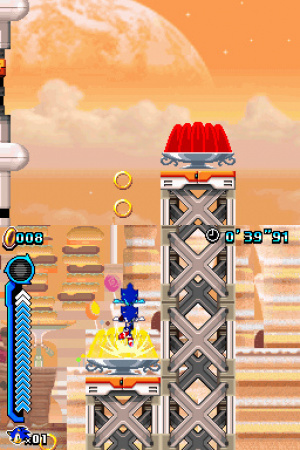 The portable part of a hedgehog double whammy, Sonic Colours is – you guessed it – a high-speed 2D platformer. But wait, there’s more: this time Sonic is joined by a range of unique power-ups that help to refresh the standard formula. If you’ve played either of the hedgehog’s previous two outings on DS, the very enjoyable Sonic Rush and Sonic Rush Adventure, you’ll be right at home. Sonic has his usual move set of homing attack and the spin dash, but the boost gauge from the Rush series carries over too: charged up by defeating robots and collecting power-ups, a press of Y sends Sonic bursting forward, smashing just about anything in his path. As boost is the first of the Wisp power-ups you unlock, you’d be forgiven for thinking it’s so far, so Sonic Rush 3, but with each new power-up the game changes slightly. 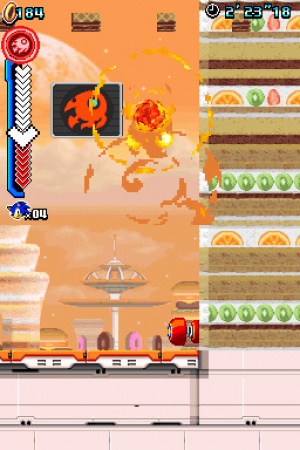 The rocket ability makes great use of the DS’s dual screens to bring a new verticality to the gameplay, and the fiery burst power-up is essentially a multiple-jump, letting you cross wide chasms and, of course, blow things up. With a new power-up revealed in each Zone, going back to previous stages opens up access to different routes, something that previous Sonic games on the platform have struggled to offer. It’s not to say that there’s multiple exits and stacks of tucked-away secrets, but the new abilities actually encourage you to slow down and explore your environment rather than blasting through at top speed. Whether you think that’s a good thing or not likely depends on your view of what constitutes a good Sonic game. The zones themselves also stray from the classic templates laid out all those years ago in the hedgehog’s formative 16-bit days. The game’s theme park setting offers mountainous cakes, skeletal roller coasters and flooded Japanese pagodas, so there’s no shortage of imagination, but the sights are rarely memorable, with the exception of the boss stages. Played out in 2D but presented in 3D, each boss follows a set pattern with patience, timing and skill all required to take them down, with judicious use of that Zone’s particular Wisp power-up required to succeed. Later encounters offer the kind of palm-sweating tension that characterises all great boss battles, with the final standoff borrowing elements left, right and centre from Sonic Adventure, Sonic the Hedgehog 2 and more. In between all the Wisp-collecting and boss-bashing is a lot of dialogue between Sonic, and almost every side character going – yes, even Big the Cat. Thankfully such cutscenes are completely skippable, although should you find yourself missing out on a piece of vital information you can revisit any scene from the main menu. Generally such cutscenes act as a prelude to a particular mission, which vary from passing a stage in a certain time limit to defeating a number of enemies. Whilst it’s not necessary to complete the missions in order to proceed, their short bursts are often perfectly pitched for “one more go” score attack sessions that tend to eat up more time than you might realise. An overhead map view ties each world together, with different nodes within each Zone representing missions and Acts. It’s a simple and efficient way of presenting the stages, and means you’re never more than five seconds away from heading back into the game. There’s also multi-card multiplayer modes for two players to face off against each other and a CPU race mode included for solo players, but this predictably fails to captivate in the same way as racing a human opponent. Unlike its Wii counterpart, there’s no cooperative mode here, just flat-out racing, which may disappoint some. Graphically the game’s greatest asset is its pace, which is absolutely unrelenting: there’s never a trace of slowdown in the regular stages, and the 3D bosses hog the whole screen to lend a palpable trace of menace. The rainbow effect that accompanies the boost is pleasing, and the transformations all look the part – our favourite being the terrifying “Purple Void” – but on the whole there’s not a whole lot of improvements made here since 2008’s Sonic Rush Adventure. Whilst the majority of the gameplay will feel familiar to Sonic veterans, particularly those who’ve enjoyed his previous DS outings, the Wisps genuinely refresh the gameplay by adding new routes to spice up each stage. It’s fast, loud, bright and bold, and a recommended slice of high speed action. See ya at the store! ...all creatures great and small. Didn't you just love morning assembly? Big the Cat is in this? And the others as well? .... Eh, I'd rather have the Wii version. 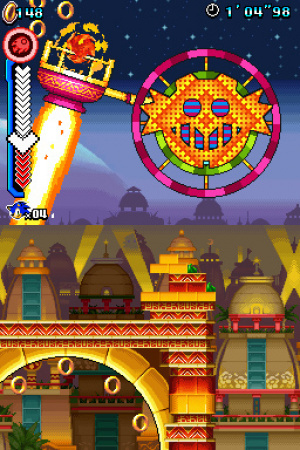 Does anyone else feel like the environments in this game aren't as pretty or impressive as Sonic Rush's environments? The graphics look pretty poor from the shots shown. Then again I found the Sonic Advance games to look pretty poor as well in comparison to other games on the system. I've played both and I prefer the DS version. Just me personally. Great review J Man! Looks very fun! Definitely getting the Wii version! who's reviewing the Wii version? Let's see how much score gets the Wi version. Anyway, looks good. I'll take competitive racing over co-op for this game. I'll be picking it up tomorrow! I wish it still had co-op, though. Oh well. Does the sonic hat come with Wii and DS for the pre-order? J is also reviewing the Wii version. It's in good hands. You still didn't review the last sonic rush game! OMG! That 3-Eyed thing is stolen straight from Disney's Chicken Little!!!!!! What?! A crime I tells ya! I hope someone gets on that. What Wi-fi features does this have? I hope the Wii version can be just as if not even more impressive! It features online leaderboards, both DS and Wii version. Just a little longer.... Come on Sonic Colors come into my posession! ^^ Very nice review though. I even liked the demo on the DS. The wisps are a very nice addition to the game. I played the demo and liked what I saw, but I was never really a Sonic fan...still debating on weather to buy either this or the Wii version. I played the demo and oddly, I found this more enjoyable than the Sonic Rush's. Great review James. Me and the lad have played quite far into this ds version of Sonic Colours. Brilliant. The environments are better in this one when compared to Sonic Rush Adventures IMHO. Sonic Wii is amazing as well. The Wii and DS versions are individual games. 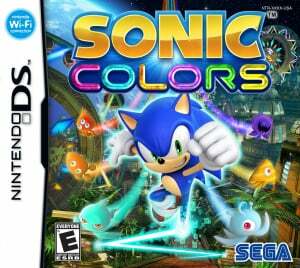 Sonic 4 or Sonic Colors DS? Which do you guys prefer? And what about the Wii version. which do you think is more fun. I haven't got around to playing the Wii version yet, but I will do. For me, I prefer Sonic 4, but they're both very good games. No thanks, but I'm glad it's a great game. @James Not sure if you'd know the answer, but when is the Super Scribblenauts review out (if it's coming at all, that is)? Facepalm to all those characters being in the game when they've been bragging about keeping the cast small on the Wii version. There should have been a review of this at least four days ago! @Sadman: Hadn't realised NL was running on strict deadlines. Nice, buying both versions today. @Sadman Yes boss! What next, boss? Review games on release day, boss? What about my job and wife and all the other site work boss? Yes boss! You're the boss, boss! To be slightly less flippant, the game only arrived on Friday. That game seems pretty good. I might buy it for myself on xmas! Sega has some hacking games which surprises me. I played the demo verson of this game at nintendo channel. And tell you truth I wasnt really impressed by the graphics in the ds version. So im gettin the wii version. Just bought the Wii version today and love it. Since I -own a Rush game on my DS, I doubt i'll pick it up, but glad to see its good! Since I wasn't a vary big fan of Sonic Rush, I'd much rather play the Wii version. But this does look pretty solid I suppose. I might pick it up when its cheaper. "All things bright and beautiful"? Are you back in Sunday school? Seriously though, I played the demo on Nintendo Channel's DS demo download service and, except for not being able to properly time the homing attack (same issue with Sonic 4 Episode 1), it was an interesting experience. I played the demo of this from the Nintendo Channel, and I found it handled quite nicely and much better than Sonic Rush in my opinion. Good review none-the-less. How could this get a better score then Sonic Generations 3DS? I own both and i think that... or no i KNOW that Sonic Gen is better! I can't find my game card of this game for my DS and this is so awesome! The burst color power is cool! The unlockables are a better on this than Sonic Colors (Wii). This is so much fun and a worth-play for the DS. 9/10.